The American College of Physicians is acknowledging the important role of point-of-care ultrasound (POCUS) in internal medicine. In recent years, POCUS has been used by an increasing number of internal medicine specialists and subspecialists to improve diagnostic timeliness and accuracy. 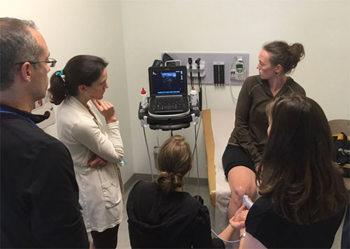 ACP is collaborating with other professional societies to facilitate the implementation of appropriate uses of POCUS throughout internal medicine training and practice. Our ongoing education programs include live ultrasound webinars, live ultrasound courses and a library of recorded ultrasound webinars. View past webinars for informational purposes. If you attended a live webinar, you can still take a quiz and earn free CME. Understand some of the history of how physicians use ultrasound at the bedside to enhance physical diagnosis. In this video, Bruce Kimura, MD, explains the concepts of cardiac limited ultrasound examination (CLUE) in point-of-care ultrasound diagnostic evaluation; discusses pearls and common pitfalls to CLUE; and demonstrates the use of CLUE on a clinical case of dyspnea and hypotension. In this video, Dana Resop, MD, discusses the benefits of bedside point-of-care ultrasound vs. other imaging modalities in the acutely dyspneic patient; explains how to apply an algorithmic approach of ultrasound lung artifacts to determine the cause of acute dyspnea; and describes how ultrasound evaluation of cardiac, deep veins, and inferior vena cava can add to lung ultrasound in determining causes of dyspnea. Renee Dversdal, MD, discusses the use of point-of-care/beside ultrasound. In this webinar, she covers the use of point-of-care (POCUS) ultrasound for diagnosis versus monitoring of treatment; shares at least five POCUS applications pertinent to the care of Internal medicine patients; and describes at least two POCUS uses that can augment your physical exam and clinical decision making in real time. A collaboration between ACP, the American Institute of Ultrasound in Medicine (AIUM) and the Society for Ultrasound in Medical Education (SUSME), this webinar was led by Richard Hoppmann, MD, FACP, Dean Emeritus, University of South Carolina School of Medicine, Director, Ultrasound Institute, Dorothea H. Krebs Endowed Chair of Ultrasound Education. The AIUM designates this enduring material for a maximum of 1 AMA PRA Category 1 Credit(s). Physicians should claim only the credit commensurate with the extent of their participation in the activity. Expert faculty provides a comprehensive and in-depth look at how and where medical Ultrasound can effectively be used in point-of-care and general medicine settings. CME is offered. ACP members receive discounts on registration. There are no live courses scheduled currently. Sign up for quarterly webinars that focus on the use of Ultrasound in primary and critical care. These webinars are free to ACP members, and they offer CME. There are no live webinars scheduled currently. ACP MEMBERS: Discuss this topic in the Member Forum on Point of Care Ultrasound.